Tagged convention, fantasy, hugo awards, nebula awards, science fiction. Bookmark the permalink. I’m practically literary above, so I’ll stop — or think of a better illustration. Could it be that some “literary” or “academic” stories don’t take the reader through significant arcs of change? Change may be implied, and the weight of the change on a character may be examined, but do they give the reader the vicarious experience of the change? I don’t know. 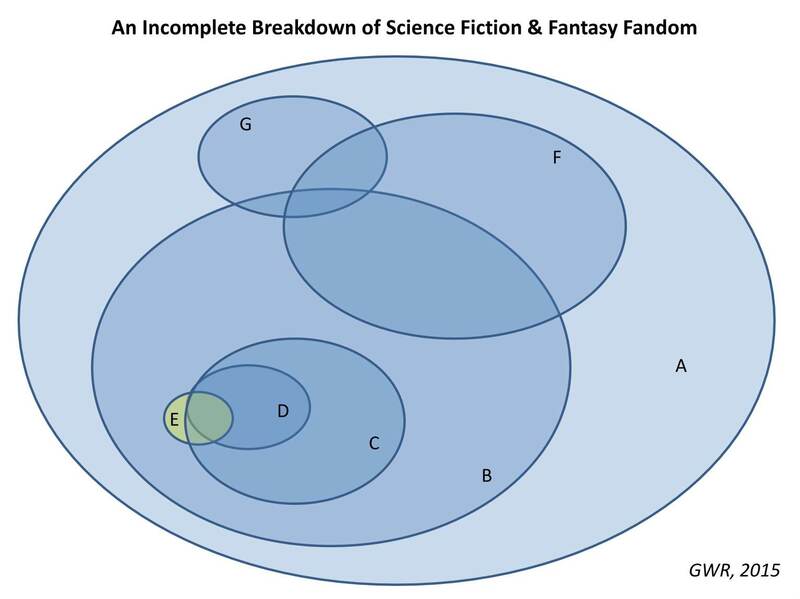 Torgersen’s original Venn diagram left half of the WorldCon voters hanging outside of fandom, which I thought was uncalled for. I like your version better–it’s nice to see you acknowledge that anyone who cares enough to go to WorldCon or blow 40$ on a supporting membership, may reasonably be called a fan. I’m not quite sure that encouraging current fans to vote on the Hugos is going to increase the number of people who read science fiction and fantasy. That seems backwards to me. If something persuaded more people to read SFF, then yes, that would make more people who might be interested in voting on the Hugos, but not the other way around. And I kind of suspect that the current situation, with one group block-voting on the basis of politics, isn’t going to help at all. Especially since they are motivated by the politics of the past, shouting at those young social justice folk to get off of their lawn. When the young folk are actually in a public park. Though I have to admit last year we had something like 1,500 new voters. Some of those will have been the WoT folks, of course, and I don’t know if they’ll be back. But a lot of them were there, like me, because while we didn’t have an opinion before, once the Sad Puppies got done dropping mud in our Post-Toasties, we found we did have an opinion after all, and we were willing to pay $40 to express it. So it might bring more voters to the Hugos after all. I guess we’ll see. I’m sorry, to believe that, you have to misread Brad’s diagram. The yellow circle is labeled “FANDOM” [WORLDCON]. To say that fandom is hanging outside of fandom is nonsensical. Meanwhile the blue circle is labeled GENERAL F/SF CONSUMER AUDIENCE. 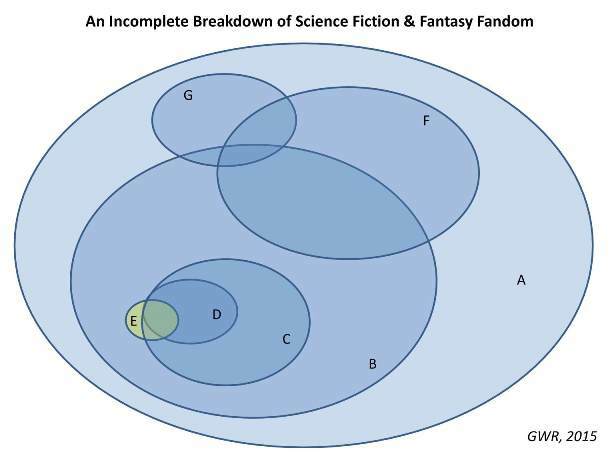 The diagram shows that some of the interests of “FANDOM” [WORLDCON] intersect some of the interests of GENERAL F/SF CONSUMER AUDIENCE, and some do not. It does not say that some people are not fans. We might argue whether the logical statements of the diagram are accurate or not. I think they are: the general audience likes some things that fandom does not, and vice versa. The idea that two populations share some interests and not others is not particularly surprising. But to argue that Brad was excluding people is absolutely false. Like Martin, I didn’t see Brad’s representation as implying that WorldCon members were not actually fans, but I can see how it could be interpreted that way. I’m glad you thought my version was at least partly accurate. As for increasing the number of people who read SF&F, you’re right that such an outcome won’t obtain immediately, soon, or possibly ever. It seems, though, that if the Hugos (or whatever alternate award we might come up with) come to reliably honor works that more people in ellipse A find enjoyable, then it is at least possible that over time that rocketship “stamp of approval” might come to mean something outside the convention circuit and thereby be something of a welcome sign to those outside the genre. It does bring up something of a juxtaposition between the categories: of late it seems most of the print media nominees and winners have been minor works, often from smaller venues, whereas the dramatic media nominees and winners have almost all been highly successful before the Hugos gave them any recognition. It would be interesting to see if that has been the case throughout the history of the awards. Re: Small numbers. The Hugo voting group E numbers 5,000 or less. It’s definitely a tiny fraction of A or B. The big digests (Analog, Asimov’s, and F&SF) have readerships in the range of 20,000 to 30,000 (per Gardner Dozois’s Year’s Best Science Fiction tabulations). Hit novels put the digests to shame. And hit movies are bigger than that. In a perfect world, E would be a representative sample of A, but considering sales figures vs. award nominations, it’s not. Those are good numbers, Martin — I’m glad I didn’t try to make the ellipses proportional! Especially since, as you point out, SF&F “hits” reach so far and wide. OK, you’ve got G and B overlapping, and they’re contradictory. So move G to the other side of F but not overlapping B, and then you can fit H (people who have never heard of the Hugo Awards) right there inside A and overlapping B and G.
Hmmm. Interesting idea, but I’m pretty sure there is a small population of people who might admit to themselves that they like certain movies or TV shows or are even fans of certain SF&F franchises, but who would categorically deny being science fiction or fantasy fans if asked … because I’ve met such people. That’s the reason I made a little overlap between B and G, though in practical terms it probably should be even smaller than I showed it to be. As for people who haven’t heard of the Hugos, I thought of doing some funky amoeba-shaped region that would spread from A into B and G and even into C, since I’m pretty sure there are a number of gamers, media fans, etc., who attend conventions who either because of youth or disinclination to literary matters simply haven’t noticed the Hugo Awards — but that was more work than I wanted to do. Thanks, Peggy! I’m glad you found something to like in my little essay/rant, and I hope if you read my stories you’ll find something to like in them, too! The fact that you found part of it silly simply proves that not everything resonates with everyone — and that’s okay. As someone who lives in your Ellipse A/B (and possibly F? ), I have found the blog posts pretty interesting. It appears my tastes probably run pretty close to yours, so I would not be reading much (if any) “literary SF” — heck, ask Sharon my opinion of “literature”; I give her enough grief about it. I don’t select my reading list based on awards, so something winning a Hugo or Nebula or whatever will almost certainly not increase my likelihood of reading it (unless it comes highly recommended by someone I’ve found has similar tastes. I find that most of the time, I select almost on impulse when something looks interesting, select something from an author I really like from previous reading, or something that is recommended. That a small contingent is deciding the vote is probably not unusual. I’ve often found critically acclaimed film terrible, while stuff I like is panned. Heck, our elections are similar with a sometimes small contingent driving the result (in primaries, battlegrounds, whatever). Thanks for the blog topic! I find the blog posts on this and other publishing stuff an interesting insight into a subject I’ve not much previously considered. 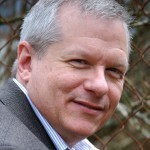 David, you’re exactly right about small numbers often deciding big things — not at all surprising, but it has been a source of confusion and in some cases consternation to observers of the process. And I suspect many other friends and most of my family share your exact experience of living “outside” the world of the devoted SF&F fan, largely unconcerned with and unaffected by this little corner of the multiverse. But we’re glad you like our stories! I hopped over to the Brad Torgerson blog post you mentioned and spent most of the evening (OK, back and forth between that and the Clemson BB game), reading through the entire thing plus all the comments.